When you don’t use the average basis method for mutual fund holdings, you have to track the basis of each separate lot of shares. Each new purchase of mutual fund shares creates a distinct lot. Many mutual fund investors use the average basis method, which eliminates the need to maintain the cost basis of each individual lot. Others prefer the separate lot method, which can be more tax-efficient. This page shows how the separate lot method works for mutual fund shares. When you buy stocks, you usually buy a specific number of shares, often a round number. When you buy mutual fund shares, you usually buy a specific dollar amount, and end up with a fractional number of shares, which may be carried out to three or four decimal places, such as 7.436 shares. Some people add to their mutual fund holdings regularly, perhaps making monthly purchases, so they can have many different lots bought at different prices. Dividend reinvestment is more common with mutual fund holdings than with stocks. Each dividend results in yet another purchase at a different price. Certain rules that apply only to mutual fund shares can result in basis adjustments that would have to be applied to each lot of shares. If you buy and sell shares of the same mutual fund on more than a handful of dates, you’ll probably need a spreadsheet to handle the calculations. The price per share of the mutual fund varies from time to time. As a result, the number of shares you receive for each $1,000 is different. What shares did you sell? Now you’re ready to use this table to figure the basis of shares you sold. Suppose you sold 84.773 shares. You didn’t specify the shares you were selling, and that means you sold the oldest shares. This would be a sale of all the shares purchased on 10/1/12 and 11/1/12, and 6.689 of the shares bought 12/1/12. Your total basis for the shares you sold would be $993.28 + $993.38 + ($993.34 * (6.689 / 38.986)), or $2,157.09. As you can see, these are quite a lot of number crunching for someone who has merely made four purchases and a single sale. 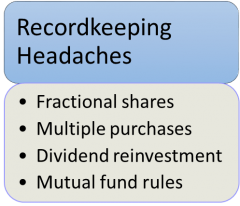 Some people buy mutual fund shares under a regular savings plan over a period of years, ending up with scores of purchases at different prices, making the calculations unwieldy even in a spreadsheet program. This is why taxpayers are allowed to use the easier average basis method. Averaging deprives you of the flexibility to micromanage your gains and losses for maximum tax efficiency, though. Now that brokers and mutual funds are required to track and report basis for covered shares, much of the burden for maintaining these records has shifted. As a result, the separate lots method may be viable for more investors despite these complexities.